The TransForm iPad app offers cardiology staff a mobile, streamlined method for accessing and managing patient data. Our interdisciplinary team of four HCI master students, working with GE Cardiovascular IT, has been tasked to design, develop, and evaluate a tool to improve cardiology workflow. The final prototype was well received by GE Healthcare. Because of client confidentiality, our final design cannot be presented. Here are some details of our research and collaboration process. The team traveled to four sites across the country to observe and interview cardiology staff members in their everyday work contexts. Specifically, we used contextual inquires to observe workflow - where permitted by HIPAA - directed storytelling to learn about past experiences, and visioning exercises to understand perceived workflow breakdowns and identify opportunities for improvement. During the synthesis phase, we created data models; created “data buckets” with key insights, quotes and findings; and organized these buckets using affinity diagramming. Testing final prototypes with hospital staff. After honing in on our application concept, we carried out additional research to more fully understand the patient data input process, and iterated based on real-user input. We went through 3 big iterations, conducted 12 usability testing at 4 sites. As the UX lead of the team, my main responsibilities in this project include research planning, visual identity and experience design, refinement testings. I also created information diagrams [see below] and storyboards, produced a concept video to facilitate communication with clients at GE Healthcare. Team: Chung-Yi Chi, Steffi Paepcke, Yuan Wang, Anthony Zhang. Circa, the wireless dog leash enables owners to enjoy the outdoors with their dog off the leash. 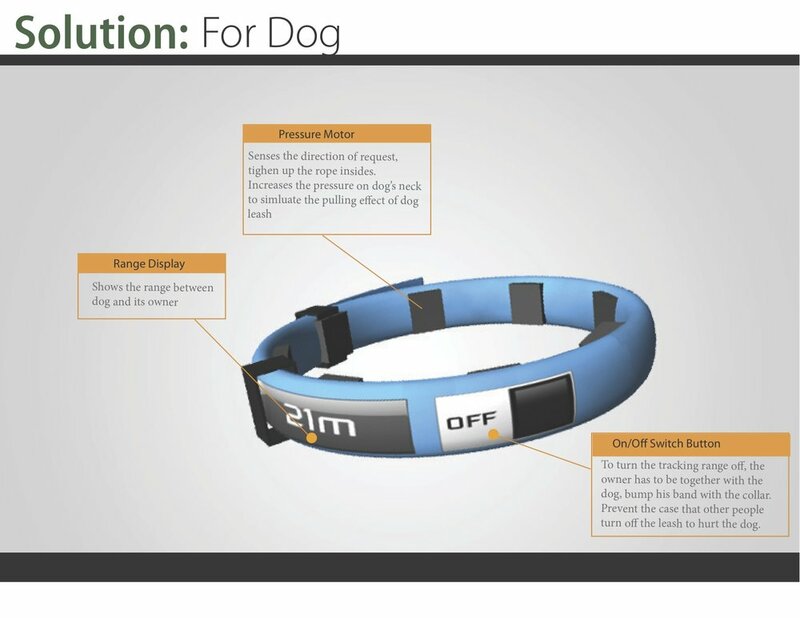 It ensures that dogs stay near their owners when unleashed, and helps runners enjoy time outdoors with their pets. With Circa, owners can enjoy a casual walk, run, or just hang outside without worrying about the safety of their dog. Circa lets dog owners always stay connected to their dog. In this group project, I was responsible for physical form exploration, high-fidelity prototyping, video sketching, and visual identity design. Team: Ben Gotow, Anubhuti Jain, Mahvish Nagda, Yuan Wang. Aaparto is a property management service to facilitate transparent and efficient communication between apartment building managers and tenants. It is a platform for tenants to provide consistent customer feedback to managers and apartment seekers in order to help with the apartment hunting process. I worked in an interdisciplinary team of four students, communicated a mobile service that is desirable for a target set of users, analyzed the technical feasibility, determined the financial viability, and pitched to venture capitals. My responsibilities included researching target users, designing personas and scenarios, and analyzing competitors and value opportunities. Team: Anubhuti Jain, Molly Nix, Yuan Wang, Yebin Zhang. This piece of work visualized the overall construction process of the Great Wall of China, which was dated from the Warring States to Ming Dynasty approximately 2100 years. For each dynasty, several variables were charted including; time range, route, location, and length. In addition; the most famous section, The Beijing Great Wall is displayed as a callout map, which displays the section in greater detail.